Billy Baron isn’t the next Mike Smrek, but he hopes to at least get the chance Smrek did. Smrek, a seven-footer, played one season for the Bulls in 1985-86 as a rookie and was the last player from Canisius College to play in the NBA. 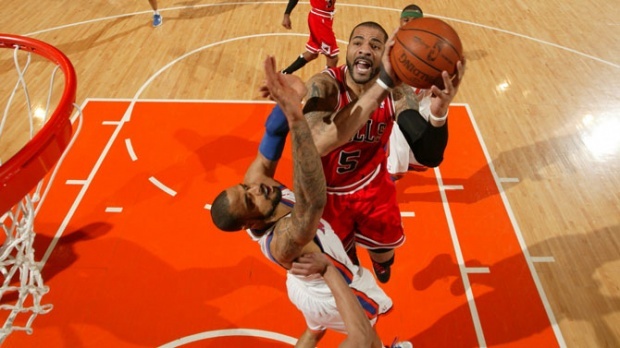 Baron, who is playing for the Bulls summer league team, hopes to be the next. “I want to show I can run a team, especially off the pick and roll, organize guys and be trusted with the ball,” said Baron, who had eight points off the bench Tuesday in the Bulls’ 107-73 summer league victory over Minnesota to go to 3-0. The Bulls were led by summer league sensation Doug McDermott with 20 points on four of seven on threes, six assists and five rebounds in just 26 minutes. McDermott is now 11 for 21 on threes in the three games and averaging 25.5 points in just under 27 minutes the last two games. Hot Tony Snell cooled off with 12 points on four of 12 shooting. Second round pick Cameron Bairstow added 11 points and seven rebounds as the Bulls held a third team under 80 points, rare in summer league play. The story was again the impressive play of McDermott, who is drawing raves. Veteran NBA coach George Karl told NBA TV McDermott’s shot reminds him of that of Dell Curry, one of the finest pure shooters in league history. Though there’s less notice for Baron, he could fill a need as the Bulls with the departure of D.J. Augustin to Detroit need another point guard. The Bulls had Kirk Hinrich on a minutes playing time limit last season and that is likely again given Hinrich finished the season stronger. And with Derrick Rose returning from injury, there’s a need for a third point guard. Baron was one of the leading scorers in college basketball last season at more than 24 points per game. He’s also a good shooter. And even though he is a rookie, he’ll be 24 in December after transferring twice in college. And as the son of a coach, he is a smart and tough player who could fit in with the Bulls. Though Baron is about 6-1, he’s thickly built and physical and shot 42 percent on threes last season with more than 250 attempts. 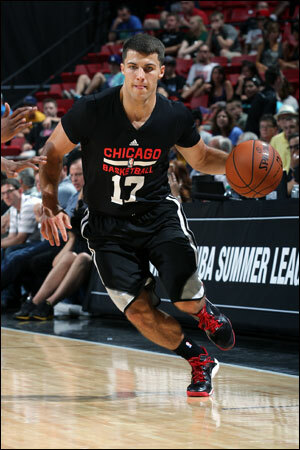 He’s averaging 7.3 points and three assists in about 17 minutes per game off the bench in the summer league games. But he’s shown an ability to lead the team and make plays off the dribble. He’s three of nine on threes. Baron’s father, Jim, was the coach at the University of Rhode Island and Billy considered playing there but opted for the University of Virginia. But after starting strong, his playing time diminished and he transferred to Rhode Island. He averaged 13 points as a sophomore at Rhode Island playing for his father and where older brother, Jimmy, preceded him. But at the end of his first season there his father was fired. Soon after being let go at Rhode Island, Jim Baron was hired by Canisius. Billy transferred and didn’t have to sit out a season. He helped Canisius to a pair of 20-win seasons and became one of the nation’s leading scorers his senior season. It’s a small school conference, so it’s a long road to prove you can play at an NBA level. But Baron is up for the challenge after averaging more than 20 points his last two seasons. “You feel you have to prove something (coming from the Metro Atlantic conference),” Baron said. “I know I had good numbers, but you always have something to prove, which is cool at the same time. You don’t get comfortable; you’re always the underdog. I love that underdog feeling. I prefer that. It makes me work a lot harder and being from Canisius I hope I can help them and hook on with a team and help their (name) as well. And then we’d get to mention Smrek a lot more. And use the nickname Golden Griffin, one of the best in college. Win/win.